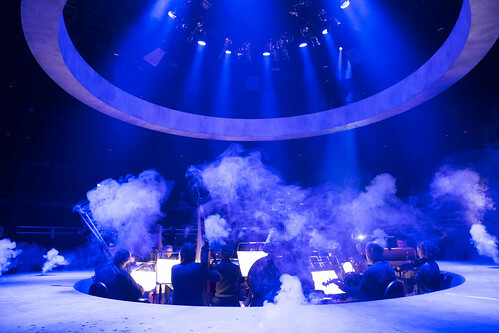 After the success of their 2015 production of Monteverdi’s Orfeo at the Roundhouse (reviewed here), the Royal Opera House returned with an English language version of Il ritorno d’Ulisse in patria, under the title of ‘The Return of Ulysses’. As its name suggests, the Roundhouse is a large circular building in Camden, North London, built in 1854 by a railway company as the Great Circular Engine House and used, albeit only for a few years, as a maintenance depot. It had a central turntable to switch engines into the surrounding maintenance bays. John Fulljames’s production for the Royal Opera House maintains the link with this central turntable with a doughnut-shaped staging with an outer raised ring for the singers with the orchestra in the central circle. Both rotated, the instrumentalists going very slowly clockwise (a bit slower than the hour hand of a watch) and the singers intermittently rotating anti-clockwise. on their circular stage.